Entry form can be found here: https://www.cyclingtimetrials.org.uk/documents/index/riders. Scroll down the page and click on Forms- ignore page not found. Hand to Jim at Rollers or by post to Jim Littlefair, 63 Nearcliffe Road, Bradford, BD9 5AX. Cheques made payable to J Littlefair. 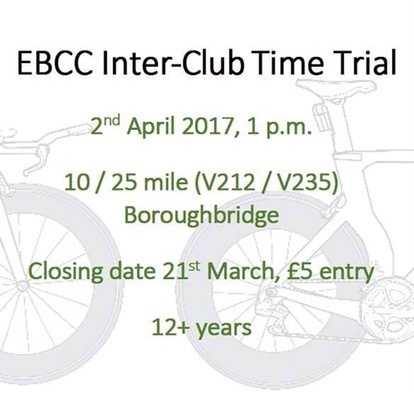 This entry was posted in Uncategorized and tagged EBCC Event., EBCC TT, Time Trial. Bookmark the permalink.